I love how this turned out. This was my first overall freehand design. I started this one earlier this spring. It had some “issues” along the way. After doing the intial quilting, I didn’t like the way the bobbin thread laid on the back. I had used Bottom Line in the bobbin and So Fine on top, and the thread seemed to be too flat on the back. After taking it off the frame, I decided to frog the piano key border on two sides and redo them — which I did. Last week while hand stitching the binding, I noticed that one side had NO PIANO KEYS! How did that happen, and how come I didn’t notice it while putting the binding on the front side???? 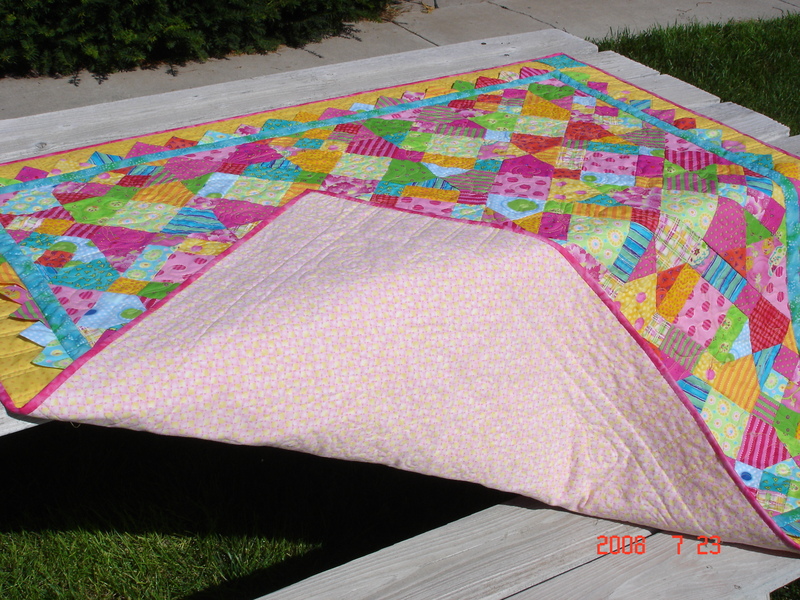 I’m not the kind of perfectionist that would removed the binding and put the quilt back on the frame, sometimes I wish I was, but most of the time, I’m glad I’m not. So after the binding was completely done, I put in the piano keys using my DSM. I doubt the baby will notice, and if so, I’ll blame it on her daddy, Bryan, who would have removed the binding!